Today’s batch is for my sister-in-law Kristin. Beat butter, ½ cup powdered sugar, and vanilla together until creamy. Stir in nuts, flour, and salt until dough comes together; you may need to reach in with your hands and knead the dough a bit. Shape into balls using a small cookie scoop. Bake for 10-12 minutes, until bottoms are light golden brown. 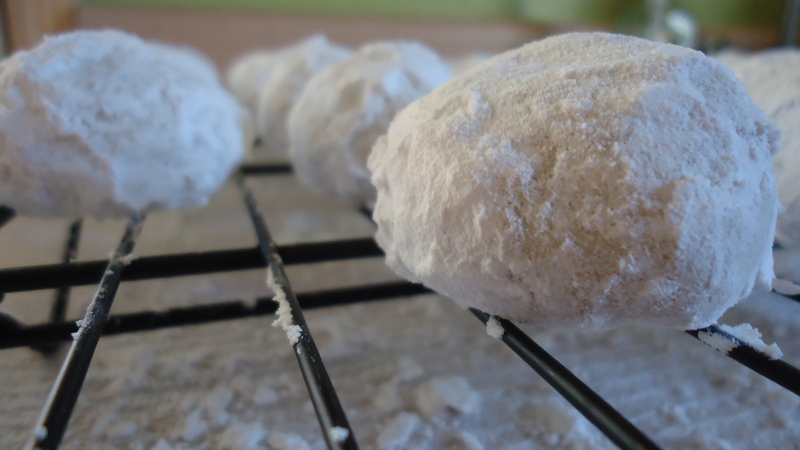 Let cool about 4 or 5 minutes, then roll in powdered sugar and place on a wire rack to cool. When completely cool, roll in powdered sugar again. This will be a great way for my roomies and I to find recipes to try out!